There's a new major player in the Colorado MMJ dispensary scene - A chain of dispensaries doing business under the name Buddy Boy Brands. Buddy Boy Brands already has seven stores in the Mile High city and has already announced plans to open its eighth Denver dispensary in the near future. Specials: Until the end of July 2014, Buddy Boy Brands is running one of the hottest MMJ specials in Denver. What kind of deal can you get? 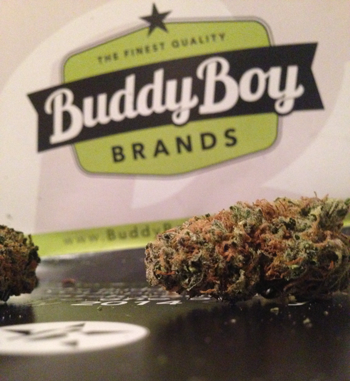 Buddy Boy BOGO (July, 2014) - Sign up as a member at any Denver location and Buddy Boy Brands will match your purchase on up to an ounce of high-grade cannabis. That's right...they'll give you up to an ounce of FREE WEED (when you buy an oz)! This BOGO deal is good at all 7 of Buddy Boy's Denver dispensary locations. Keep in mind that this deal is only available to Colorado residents with a valid medical marijuana card and ends at the end of this month. I've already designated a primary caregiver. Any other good deals at the Buddy Boy dispensary? Yes! Again until the end of July 2014 only, you can get ounces of good medicinal grade weed for only $90. If you're new to MMJ prices in Colorado, I'm not and this could be the best prices I've ever seen at a dispensary in Denver. Like the BOGO deal, this special is available to Colorado MMJ patients at all Buddy Boy MMJ stores.